SONGDO, South Korea, October 25, 2012 (ENS) – The Green Climate Fund, a multi-billion dollar fund to help developing countries adapt to and mitigate climate change, is inching toward operational status. The Board of the Green Climate Fund this week selected the Songdo International Business District, part of Incheon City, South Korea, as the host city for the Fund. The Board adopted this decision by consensus at its second meeting that concluded Saturday in Songdo. 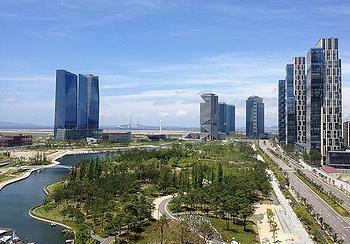 Songdo is part of South Korean President Lee Myung-bak’s effort to promote green and low-carbon growth as an avenue for future development after the country’s 60 years of reliance on export-oriented manufacturing. The new city is being built from scratch on 1,500 acres of reclaimed land along Incheon’s waterfront on the Yellow Sea, 35 miles west of Seoul. The largest private real estate development in history, it is connected to the Incheon International Airport by a 7.4 mile reinforced concrete highway bridge. By its completion date in 2015, the district is planned to contain 80,000 apartments, 50 million square feet of office space and 10 million square feet of retail space. Computers are built into the houses, streets and offices as part of a wide area network. Under South Korea’s new Framework Act for Low Carbon Green Growth, Songdo is being developed as a sustainable city with more than 40 percent of its area set aside for green space. There are numerous charging stations for electric vehicles and a waste collection system that eliminates the need for trash trucks. It is the world’s first city to have all its major buildings on par or beyond the U.S. Green Building Council’s LEED environmental and clean energy requirements. Five other countries also made what the Board called “high quality” bids: Germany for Bonn, Mexico for Mexico City, Namibia for Windhoek, Poland for Warsaw, and Switzerland for Geneva. The decision will be presented for endorsement to the annual meeting of the United Nations Framework Convention on Climate Change, UNFCCC, at its upcoming session scheduled from November 26 through December 7 in Doha, Qatar. The establishment of a Green Climate Fund was approved by world governments three years ago at the UNFCCC meeting in Cancun, Mexico as a part of the financial mechanism of the UNFCCC. The Green Climate Fund will play a key role in channelling “new, additional, adequate and predictable financial resources to developing countries,” said the Board. It is intended to catalyze climate change financing, both public and private, at the international and national levels. Monday at the ministerial meeting on climate change in Seoul, UNFCCC Executive Secretary Christiana Figueres congratulated South Korea on its selection as the Green Climate Fund host country. She called the Green Climate Fund part of “a new global infrastructure to address the full gamut of the climate challenge,” and said it bodes well for a successful UNFCCC meeting in Doha. “The scientific fact is that global climate change is upon us, that we are experiencing increasing frequency and intensity of extreme weather events and that global greenhouse gases continue to rise,” Figueres said. “The widely held misperception is that this process is stuck, that it is ineffective, that nothing is being done to address global climate change,” she said. “In Doha, you can move the second commitment period of the Kyoto Protocol from lengthy negotiations to implementation as of January 1, 2013,” Figueres told the ministers. “In Doha, you can decide how you will implement the commitment of financial support to developing countries,” she said, talking about the role of the Green Climate Fund. More information about the Green Climate Fund is available on the Fund’s website http://www.gcfund.net.